Check out the Minuteman Coffee Mug here! 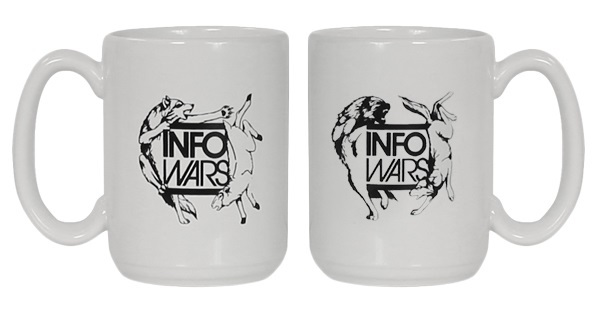 The newest Infowars coffee mug depicts the sheep, wolves, and sheepdogs analogy about society. Most of our modern society is made up of passive sheeple who spend their days watching reality television and eating fast food, unaware of the threats to their safety. Then there are wolves, the cunning elites who prey upon the sheeple for their own gain. Finally there is the noble yet fierce sheep dog who alerts and fends off the danger posed by the wolf. The Sheep, Wolves, and Sheepdogs Infowars Coffee Mug features two images that convey this message. The first is a wolf chasing a sheep around the Infowars logo. The other side features a similar image but now has a sheep dog chasing the wolf. Printed on a high quality, 11 ounce white ceramic mug.